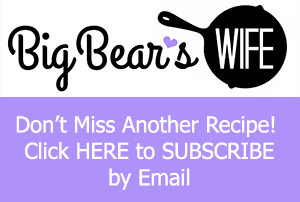 Does anyone else have a few recipes that are just stuck in their brain all the time, that are actually really, really good but so common that you don’t think to share them? Yea…that happens to me a lot. There are some things that we make all of the time at home but I just don’t picture them as “blog material”. I think “certainly everyone must already make this, or it would be silly to tell someone how to make that“, until someone points out the obvious…that everyone isn’t on the same page when it comes to food and being in the kitchen (I of course mean that in the most positive way possible). I mean think about it. If you do make something like these loaded mashed potatoes, at some point in your life you had to make them for the first time, right? Even the simplest of recipe have to at some point be “made for the first time”. 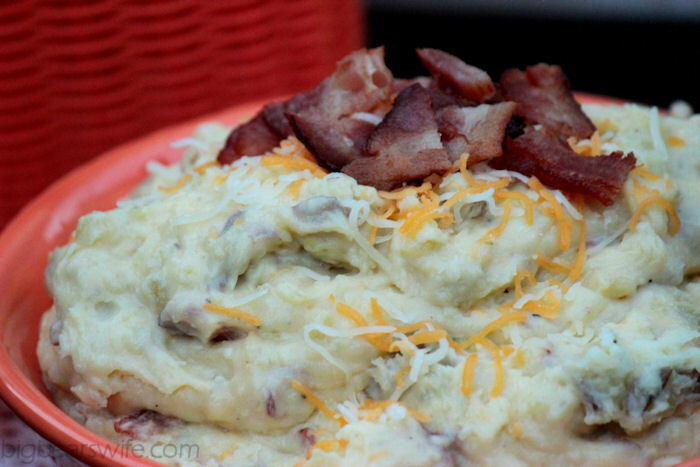 My point is that we make these loaded mashed potatoes all of the time, but they’re just one of “those” recipes. 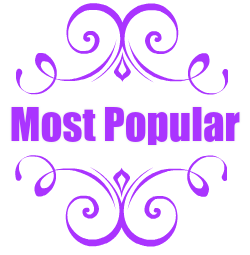 A recipe that we absolutely love but it’s not “new” and it’s not “super creative”. 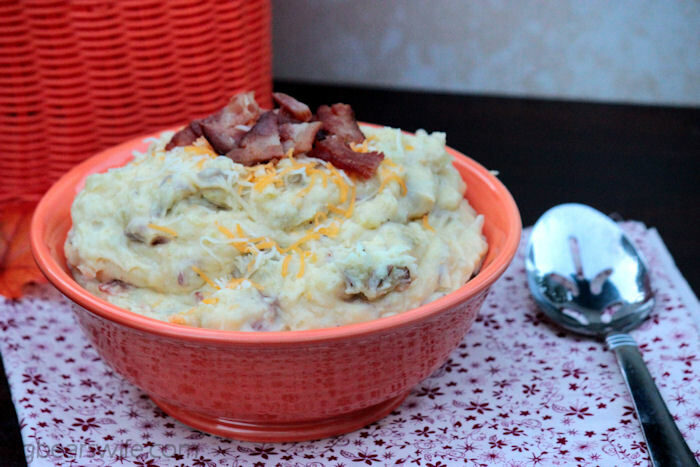 But, over the years, our “mashed potatoes” transformed from regular to amazing. I started making mashed potatoes from the box. To me, those were mashed potatoes haha and then I started making them from potatoes ;). 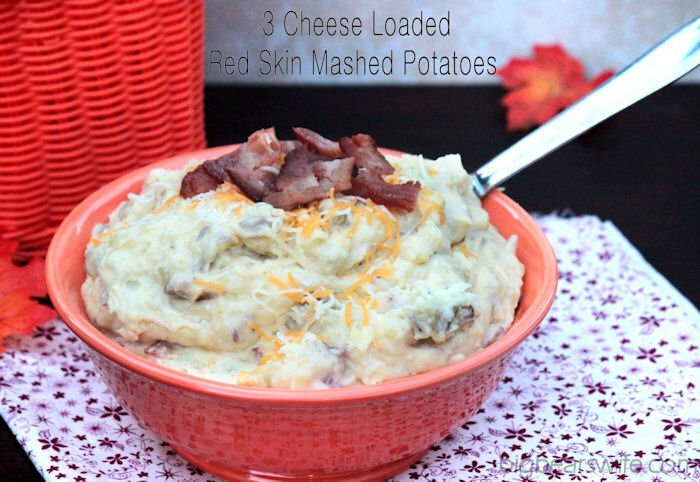 I use to only make regular mashed potatoes, then I fell in love with red skin potatoes, that let to our obsession with red skin mashed potatoes. 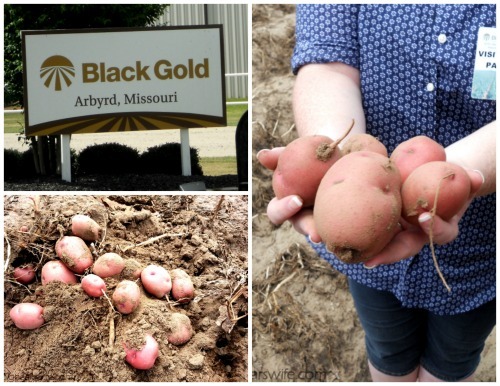 In June, I hopped on a plane and flew to meet a group of bloggers and drove to Arbyrd, MO to visit the red potato farms of Black Gold Farm. I got to watch these red potatoes being harvested from the field (even got to ride in the tractor), watched them trucked away, saw them being cleaned and watched as they were inspected and packaged up. We saw the entire process. We met the family that is behind, Black Gold Farm. We fell in love with them and with the red potatoes there. I literally can not eat a red potato without thinking of Black Gold Farm and the Halverson family! 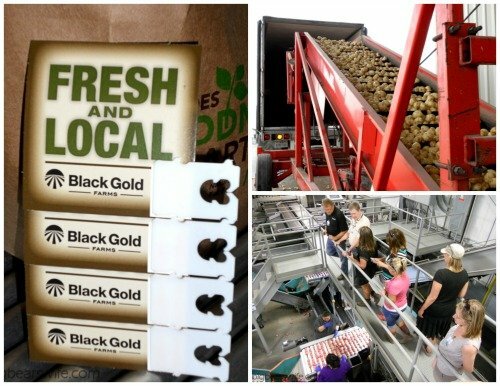 Did you know that if you eat Lays Potato Chips that you’re most likely eating a white chipper potato from Black Gold Farms?! They are the leading suppliers of potatoes for Lays! 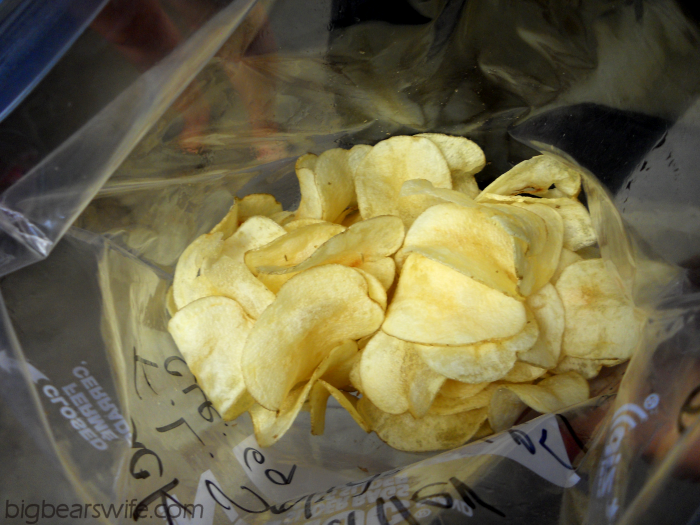 We even got to taste some freshly fried potato chips at the farm, they test each shipment of potatoes! When I make Mashed potatoes I make a lot, so that we can have them for dinner, lunches and pretty much eat on them the rest of the week. However, this recipe is SUPER easy to divide in half! Cut the red potatoes into cubes. Bring a large stock pot of water to a boil and add the potatoes to the water. Cook for 15-20 minutes or until the potatoes are tender when poked with a fork. Drain potatoes and return to pot. Mash the potatoes with a potato masher. Add in the pepper. Add in the butter and cream cheese. Mash and stir until both cream cheese and butter are melted and incorporated. Add in the cheese, 1 cup at a time; stirring and mashing after adding each cup of cheese is added. Add in the milk and stir to combine (if you want them to be creamer, add more milk). Chop bacon into 1 inch pieces. Stir in bacon. potatoes, cheese and butter? I’m in! I love that you left the skin on for the flavor, texture, color – mmmm, these look so good! My family would devour them! 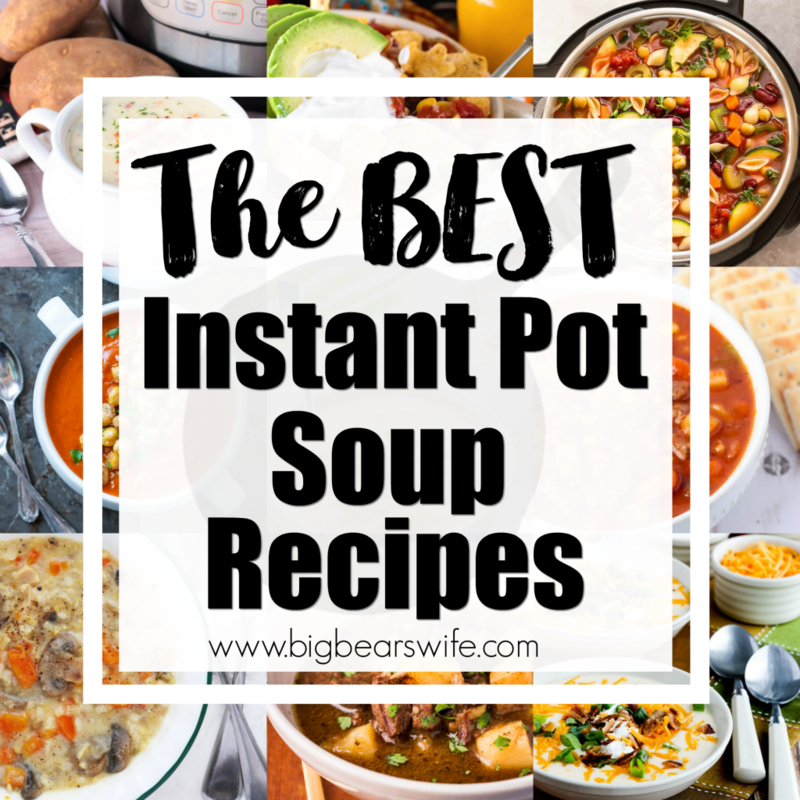 The simplest recipes that you make all the time are often the best! 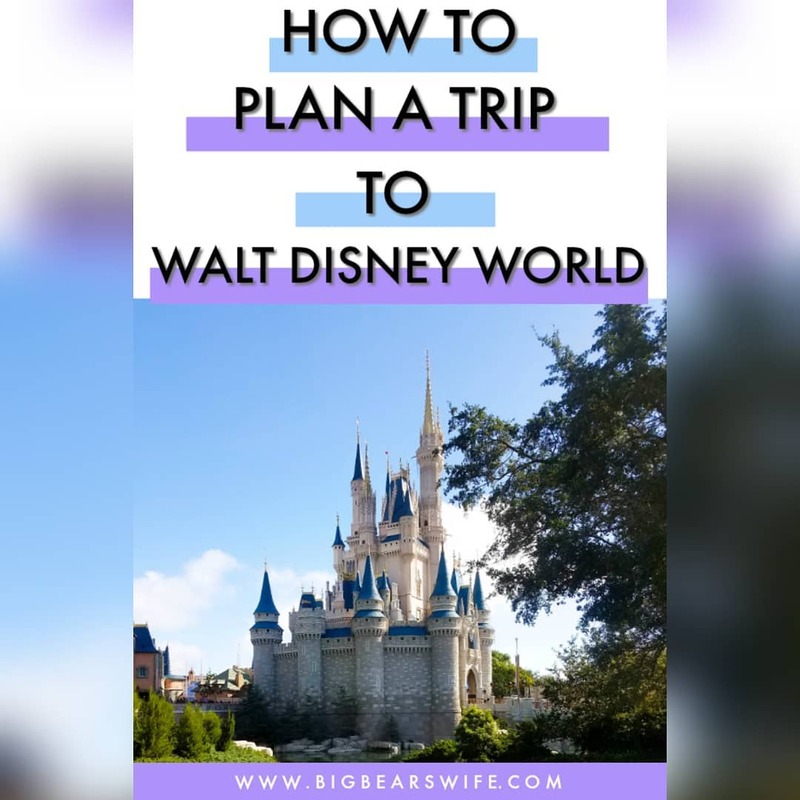 So glad you shared this! Oh and those fresh potato chips! I am soooo glad that you realized that these potatoes are most definitely blog material. OMG…seriously delish and I have not seen this recipe before!!! It looks like you had a great trip! These mashed potatoes of yours look to die for!! Holy goodness! 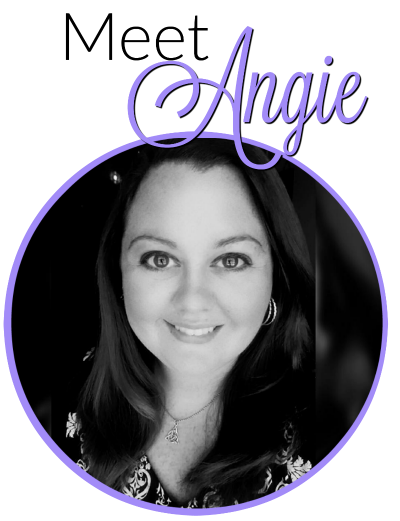 Hi Angie! These potatoes look soooo good! 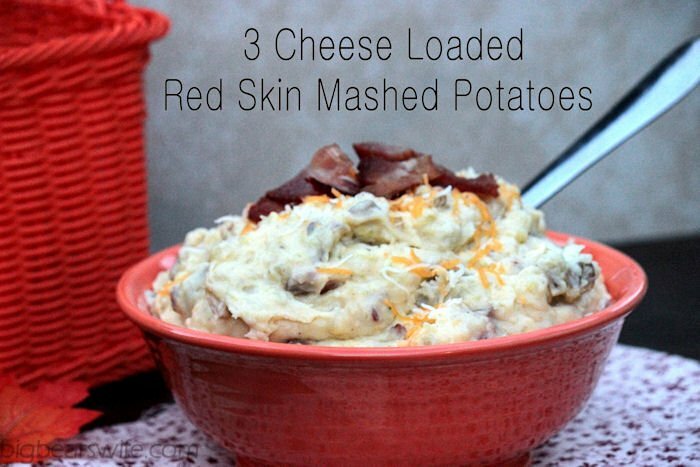 I cook with the red skin potatoes, but I have never made them like these, I am pinning these so I can try later. 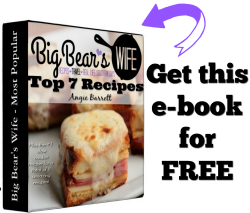 You have a lovely blog, with lots of yummy looking recipes. Thanks for stopping by Mixed Kreations. Have a wonderful day!